Modeled after the thousands of other "open streets" or "ciclovia" events that have been organized around the world and across the United States, 626 Golden Streets temporarily opens stretches of roadway for people to walk, jog, skate, bike and more. ActiveSGV event organizers are excited to bring this event back to the San Gabriel Valley. There is no "right" way to experience Golden Streets. No finish line (unless you do 626 Run). Participants may join and depart the event route anywhere they wish. We only ask that you be considerate and courteous of others along the way, enjoy the event at your own pace, and check out the many local businesses, organizations, community groups and more who will be found across the route. Promote sustainable, active modes of transportation. Encourage play, community connections, and exploration of the San Gabriel Valley's diverse communities. Improve the health of people of all incomes, abilities, and backgrounds. 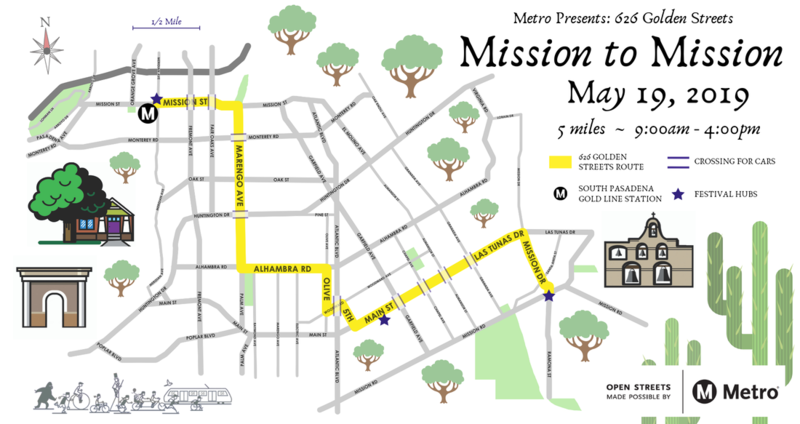 626 Golden Streets presented by Metro will link the Metro Gold Line Station in South Pasadena with downtown Alhambra and the historic San Gabriel Mission. There is no start/finish, meaning participants are welcome to join the event anywhere along the route. However we encourage participants to access the event via metro and/or people-power! Arroyo Seco Trail - The class I path comes within a mile of the South Pasadena start of the event. Take the path to its terminus, turn right (east) on Monterey Rd and then left (north) onto Mission St. The Metro Gold Line directly touches the route at South Pasadena station. Bikes, strollers, skateboards, unicycles and wheelchairs are welcome on Metro. For more information check out the Metro Trip Planner here: metro.net. We encourage attendees arriving by private automobile to park at Metro stations along the route or utilize street parking. Some restrictions may apply.